Hi everyone, 2017 is coming to an end, I know, I know! Where did that go! 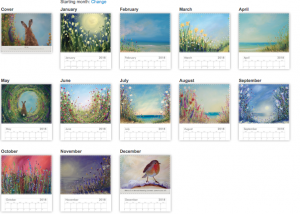 It’s been a rollercoaster year, lots of new paintings and I crossed over into a new decade, again, how did that happen?! For those of you who are planning a visit to Cardiff Christmas market this year, I shall be there again for the whole 6 weeks staring on November 9th in conjunction with the turning on of the Christmas lights in the city centre, we’re also open from 10am until 8pm that day. 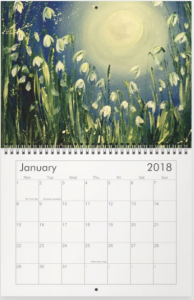 Can I still buy a 2018 calendar ? Hi Kathleen, thank you for your enquiry. Apologies, the calendars are sold out. I usually put a notice up in October and I can also take an order for one then. They usually run out in December.